Synopsis: Break away from boring! Ahh, the look of Cross Drilled and Slotted Rotors for MINI makes you smile. Something about those little holes and those cool slots adds a certain appeal to an otherwise boring set of rotors. But there are more benefits than just they way they look! The extra holes and slots allow air flow to cool the brake pads and let excess heat between the rotor and pad escape. Think of the holes and slots as little 'heat sinks' similar to what you find on a radiator or amplifier. Every little bit helps when pushing your brakes to the limit on the street or track. While there have been some negative vibes about cross drilled rotors cracking - it actually typically applies to lower quality rotors which have been drilled out without any other process. These rotors have a chamfered edge that leads into the cross drilled hole which relieves stress points that typically cause cracking. 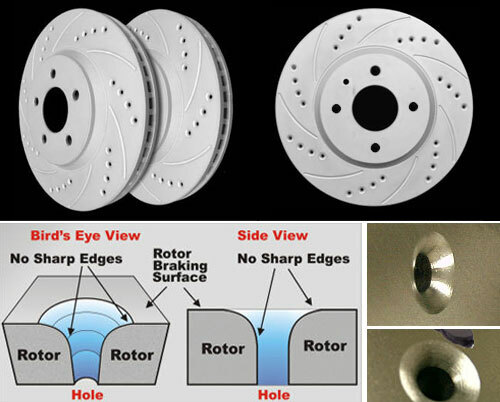 These rotors are also made of a higher quality metal than most of the generic low cost 'tuner' rotors available. These two critical differences make these a great performing and long lasting rotor that is a great option when it comes time to replacing the rotors on your beloved MINI. - Priced as a PAIR of 2 (order 1 set). Fronts are vented and rears are solid (just like the factory rotors). Hassle free, bolt-on performance - No modifications needed. Increased Brake Pad Bite - Reduces Stopping Distances. Corrosion Resistant Coating for long-lasting protection against rust..
Life Time Warranty - Guaranteed not to crack for the life of the rotors. Stops fast and looks cool behind your wheels. Rotors are sold in Front or Rear Sets. - Replace both if both sets need to be replaced. - It's wise to also replace the pads if you're replacing rotors and vice versa.